Here is a letter received in email last week. I received the Golden Armor essence and just noticed that the coloring of it is much paler than the other essences that I have received. Also, I’m not sure if I’m having difficulty combining the essences, taking too many or just peeling back layers that cause can discomfort. Can’t seem to get the right dosage and doses. This is a similar problem that I had working with a homeopath. We worked on trying to get the right remedy, the right dose for almost a year and I was quite uncomfortable. So I gave that up. I can feel the gentleness and effectiveness of your essences at times but not enough. It may be something that I have to deal with but I feel having more insight as to what to expect with these essences might help. This was my answer, edited a bit as I got it ready for the blog. Thanks for writing with your excellent questions- I will try to do my best to answer you, but please email us if I haven’t answered your questions. Let me first speak to the concern about a pale Flower Essence. Sometimes a batch of Red Shiso stabilizer is paler than other batches due to the difference in pigment in the leaves used for that particular batch. 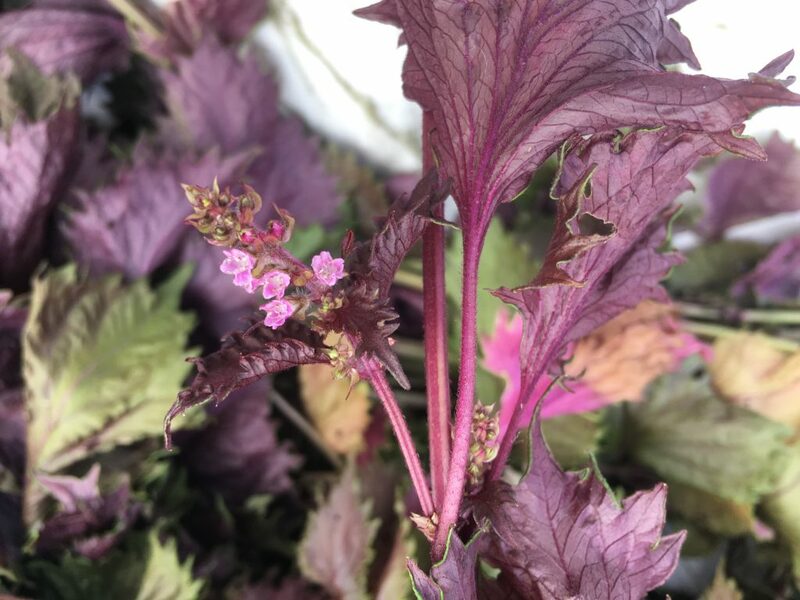 The same amount of Red Shiso leaves are used in every batch, but some leaves are more maroon in pigment than other leaves so there can be quite a difference in color. The perilla aldehyde which is the stabilizer in the Red Shiso tincture is not tied to the color, so the Essences are stabilized even when pale in color (more about Red Shiso here). I want to address your concerns about how well the Flower Essences are working for you. I looked at the Flower Essences you got- You got some powerhouses (This GHF friend ordered Golden Armor, Inner Child, Pearly Everlasting, Linden, The Alignment Garden, To Hear the Angels Sing and the Angel’s Releasing Blocks and Limits Set consisting of All Ego Contracts Null & Void, Carry Less, Coralita, Flow Free, Fragrant Ladies Tresses and Mary Queen of Scots Rose) I loved that you got a spritzer bottle as well as I feel that is a very effective way to work with the Essences (more about spritzing here). Taking Flower Essences more frequently can improve efficacy. Since you mention that sometimes the Essences do not feel like enough, I would work with them more frequently during the day. This could mean using the spritzer more often or putting the Flower Essences in a glass of water at the beginning of the day and sipping this throughout the day. This is what I do with a quart jar as my Flower Essence water container. In fact we all use quart jars here so people crochet covers to distinguish whose quart belongs to whom. Sometimes it is a bit of a mystery what the Flower Essences are doing. I often notice how an Essence helped me after the fact. I will realize that I have released some pattern that the Flower Essences were addressing and hadn’t really noticed it’s absence. I also find that if I am not finished learning from an Essence I will feel called back to it if I stopped working with it- I mostly notice what the Essences have helped with in retrospect. I want to reassure you that they cannot make things worse for you or your electrical system. The Essences are information about how to make our healing process more effective and complete. They are not chemicals that have volition to bring change to your system. To put this another way, Flower Essences do not carrying any wisdom that would bring discomfort as their whole intention is to help us raise our vibration and leave behind lower vibrations that could cause discomfort. In addition, your wise electrical system always decides what to do with the information offered by the Flower Essences and always chooses the most healing way to use this data. You mention concerns about the right dosage. With a Flower Essence, a little bit of Essence holds the same information as a lot of Flower Essence so the amount you take is not a factor. As I wrote earlier, the frequency with which you take an Essence is important as each time you take a sip of water with Flower Essences in it or use a Flower Essence spritzer bottle, you give your electrical system a reminder of how it can solve the concerns you are looking to heal. One last thought about discomfort. It is a pretty rigorous time to be on the planet. The vibrational energy is going up rapidly, much more quickly than ever before. While many embrace this shift and do their best to accommodate this higher vibration energy, there are others who are expressing their displeasure about this rise in vibration in aggressive ways. This all makes for quite a complex vibrational soup for us to swim in- a soup in which it’s hard to figure out the source of a lot of what we are experiencing and feeling. Yes, this rising vibration requires us to peel back layers and let go- as you say- and we are graced to hear from a lot of people who are working so earnestly to go with this flow. We are also hearing from many who bear the brunt of people who are resisting the flow and making it difficult for others. All in all, these times appear to be a tough stretch for most everyone. Flower Essences bring a wisdom to this metamorphosis that is so very helpful. This is because their wisdom is grounded in their own evolutionary process and thus is all about supporting us to evolve and change. Every one of us must blossom and grow right now. I am grateful to have the wise counsel of Flower Essences to show us how. PS Do you have our Guidebook? This might be a really wonderful way for your to deepen your friendship with the Essences- They want to be staunch allies in all that is going on for you- This book shares their words (and some of mine) for 300 plus pages! For thirty years we have helped women to find Flower Essences to support them to conceive and give birth. It’s a mission we feel passionate about. Over the years, as you have come to us with specific questions for specific concerns, the Angels have offered their suggestions of specific Flower Essences from our large collection. 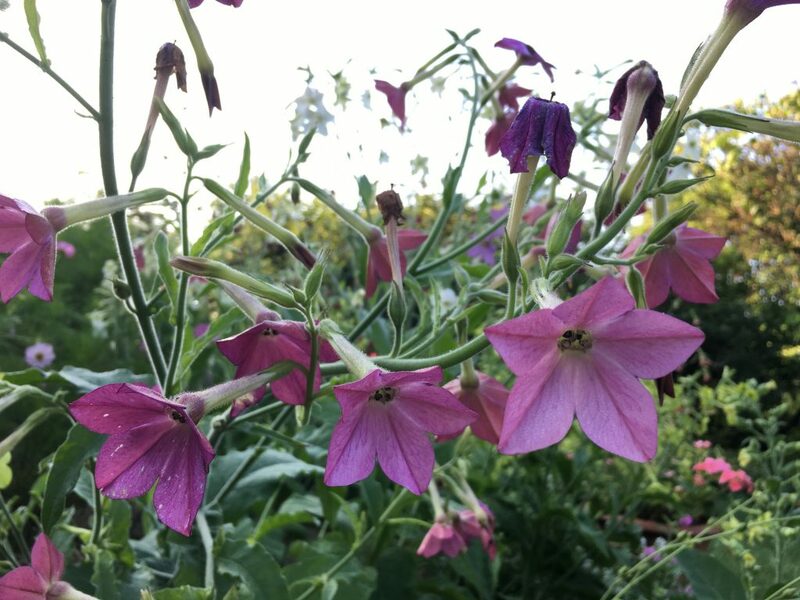 Additionally the Angels have asked us to seek out certain Flowers in different places in the world and to grow certain Flowers here at the farm to make Flower Essences to aid this work. 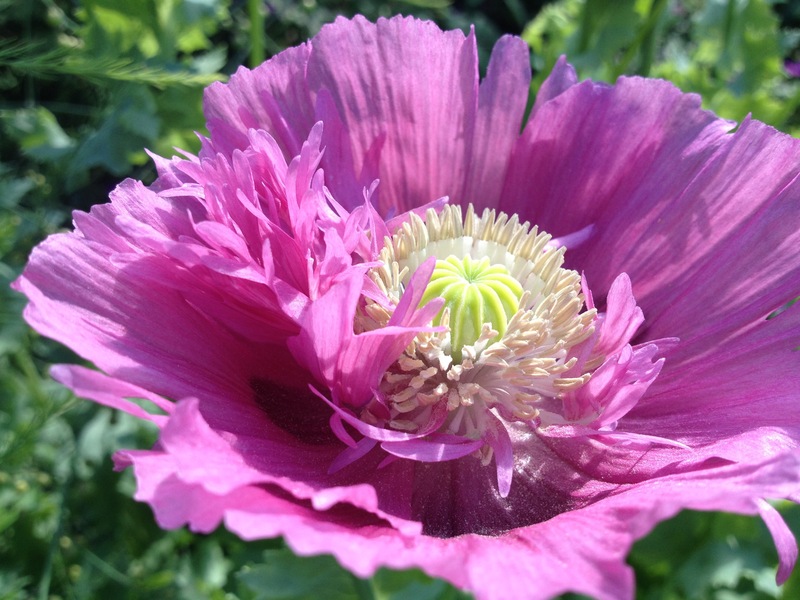 We have loved bearing witness to how often these Flower Essences have made a difference. 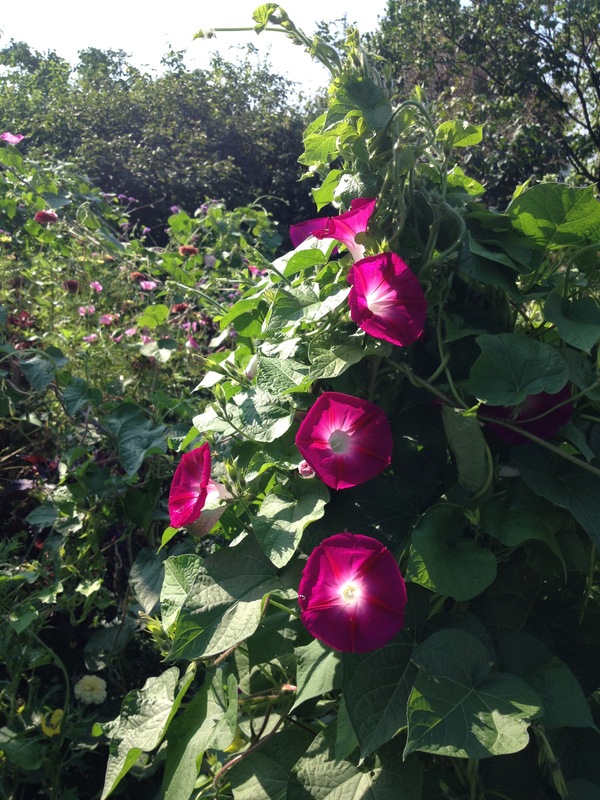 Flowers make it possible for plants to bear fruit and reproduce. Flowers are the reproductive organs of the plant. They are essential to the development of seeds and fruit. 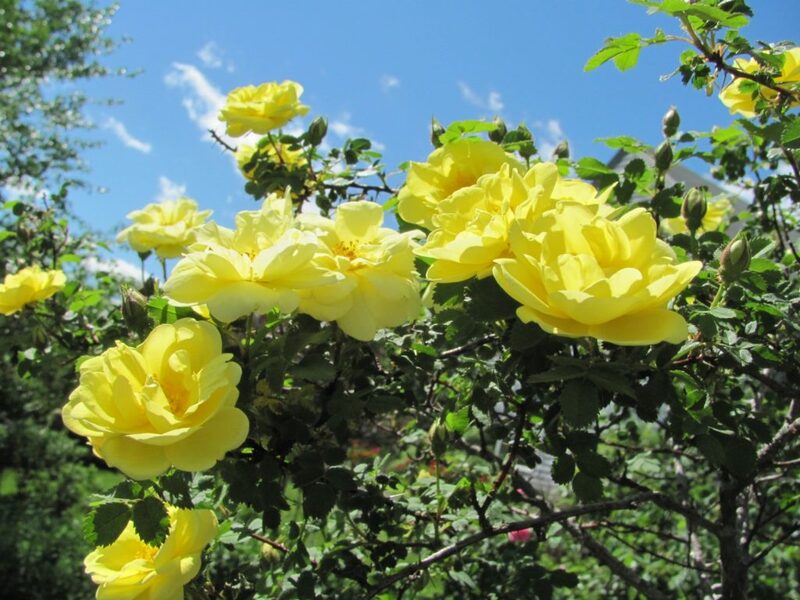 This means that the Flowers’ wisdom is particularly helpful when we want to bear fruit ourselves. 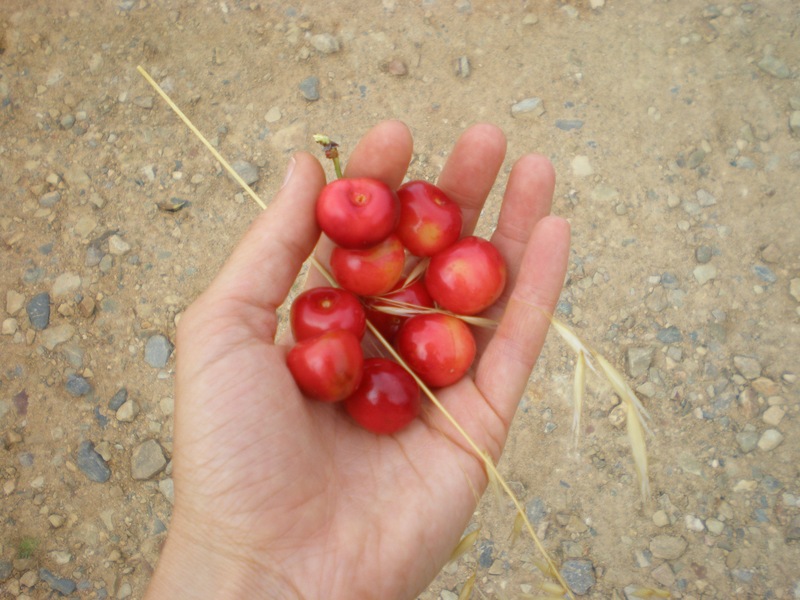 I have heard other healers say that women need to eat fruit if they want to bear fruit. It comes as no surprise that Flower Essences also support this dynamic of bearing fruit in a direct and powerful way. Flower Essences are the electrical information of the Flowers and NOT chemical. This means they are safe for before and during pregnancy as well as for the baby when he or she arrives. The only chemical ingredient in the Essences is the stabilizer which we make from organic Red Shiso grown here on our farm and a small percentage of non GMO white vinegar. Red Shiso is a member of the mint family and is used extensively in Japanese foods such as umeboshi paste. If you have any concerns about taking Flower Essences internally, please know that you do not need to take them internally. They work just as well rubbed on the skin, put in the bath or spritzed around your body. These are all ways for the information to be received by your electrical system, a system that reads the Flower Essence wisdom and knows just what to do with this data to improve your health and well-being. Babies both in utero and after birth love Flower Essences. We find many pregnant women and new mothers feeling drawn to use a lot of Flower Essences because their babies want them so very much! The Angels asked us to create this document as a way to share what we have learned about fertility, conception and our Flower Essences. The Angels divided this document into different topics beginning with their suggestions for the overall health of women’s reproductive systems and then on into other topics of concern. Men’s reproductive health is also a great concern, and you will find Flower Essence information about this too. This document reflects the Angels’ knowledge as well as what we have learned over the last thirty years from your experiences with Green Hope Farm Flower Essences. We are grateful to all of you who have welcomed us into your lives as you worked with the Flower Essences to conceive and give birth. We thank you for all the ways you helped us create this tried and true list of supportive Flower Essences. We know it often meant being vulnerable in the middle of a difficult time. In this document, the Angels often suggest several Flower Essences for a concern. A brief description is given for each of these suggestions and each Essence is linked to its description on our website. Longer descriptions can also be found in our Guidebook which is still available. You can work with as many or as few Flower Essences as you want as each Flower Essence offers electrical information that will dovetail beautifully with other Flower Essences. When choosing Flower Essences to support yourself, trust your own intuitive sense of what is calling to you. Even if it is just a small flutter of, “That one feels strong to me,” trust yourself! If you have any questions or want support to figure out which Flower Essences to work with, please remember that we are on email to receive your questions and help you choose Flower Essences. All of these Flower Essences are in stock. Most are on our main line up and can be found by using the given link or the search function on the website. These main line up Flower Essences are easy to order online or via email. The Flower Essences that are not on our main line up on the website but from our Additional Essences list are marked with an asterisk. To order these Flower Essences you can email us your order, and we will send them off to you with an invoice tucked in with your Essences OR you can order online. To order Additional Flower Essences on the online ordering system *Search Additional Essences in the search bar * Add quantity and size *Write the names of the Additional Essences you want in the comments section at check out. The Angels explain that specific Flower Essences serve the health of specific parts of women’s reproductive systems. 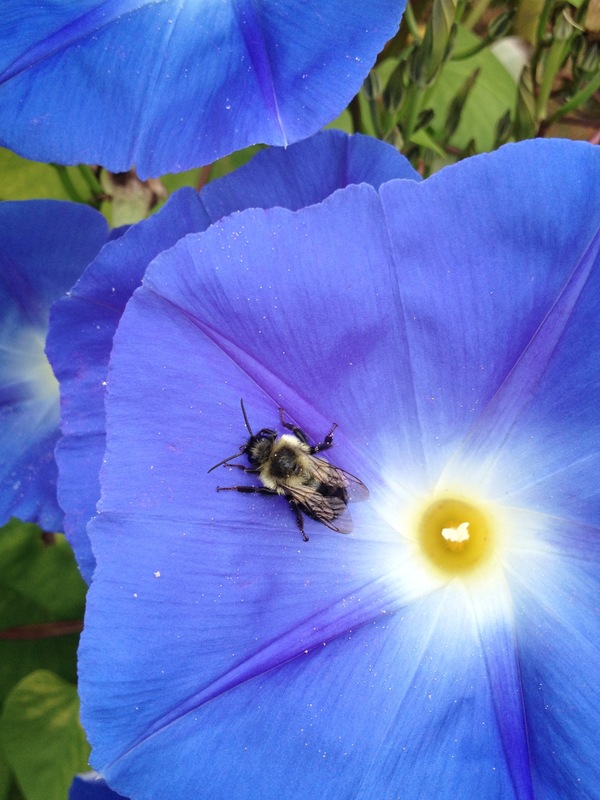 The Angels wanted us to begin this document by highlighting these core Flower Essences. Cyclamen– Cyclamen’s focus is on the health of the cervix. The cervix is the doorway into a woman’s essential being and worthy of our most assiduous support. The cervix plays a key role in helping us protect the sanctity of our energy system. It also supports us to energetically open ourselves in creative self-expression when we feel safe. Reflecting this role as energetic doorway, the cervix is a very complex cellular interface composed of both internal and external cell types. Cyclamen supports cervical health and helps resolve health challenges of the cervix. Use with Pomegranate if feelings of powerlessness, vulnerability or safety are present. This dynamic duo of Cyclamen and Pomegranate will work together to heal these wounds and restore a sense of personal power. Pomegranate– Pomegranate is a powerhouse of support for ovarian health and a key Flower Essence to work with if there is any concern about the ovaries. In addition, Pomegranate is the champion of the entire reproductive system and brings a deeply restorative wisdom to the whole reproductive system. It pairs beautifully with other Flower Essences. Scarlet Cordia– Scarlet Cordia supports fallopian tube health and wellbeing. It is excellent for clearing blockages and keeping the passageways of the fallopian tubes clear. It is vital to love our reproductive systems throughout our lives, even when we are not embarked on the journey of childbearing. 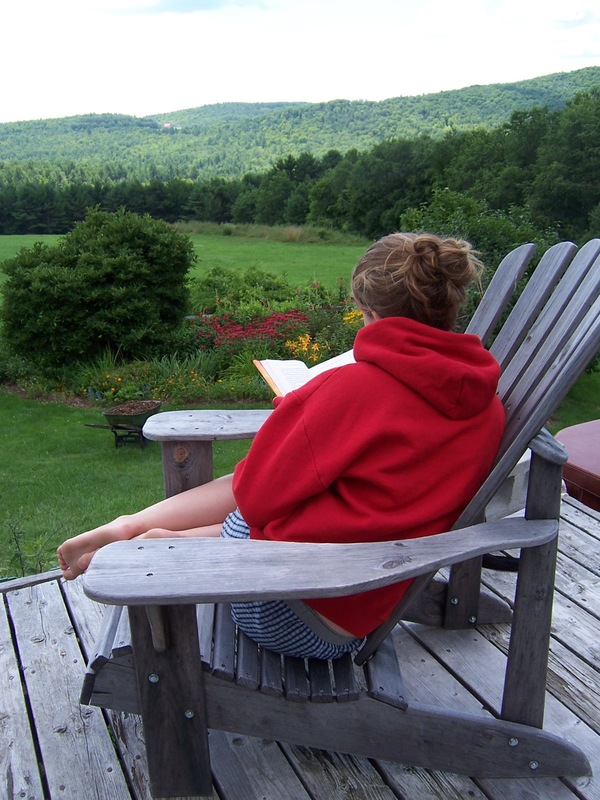 Our reproductive system is the seat of our creative life and always plays a vital role. When we want to conceive a child, it is essential that we work with our reproductive systems and cherish them. What does this mean? First, our reproductive systems are often something we have ignored, overridden or considered the source of our least favorite days of the month. We may well have dismissed our reproductive systems’ gifts for a long time. Loving attention to our reproductive systems is deeply healing. Consider talking to this part of your being and welcoming it into loving friendship as a long lost friend who has always been working for you. Housecleaning is another way forward. Think how we would prepare a guestroom before a beloved visitor arrives. So too we prepare our wombs for children to grow. Besides care and feeding our bodies for optimum health, when we want to get pregnant, it is very important to reinvigorate this part of our physical system by pouring divine, healing light into our electrical system and specifically our reproductive system. One way to do this is to visualize white light pouring into the crown of our heads then down through our entire being most especially into our reproductive system. 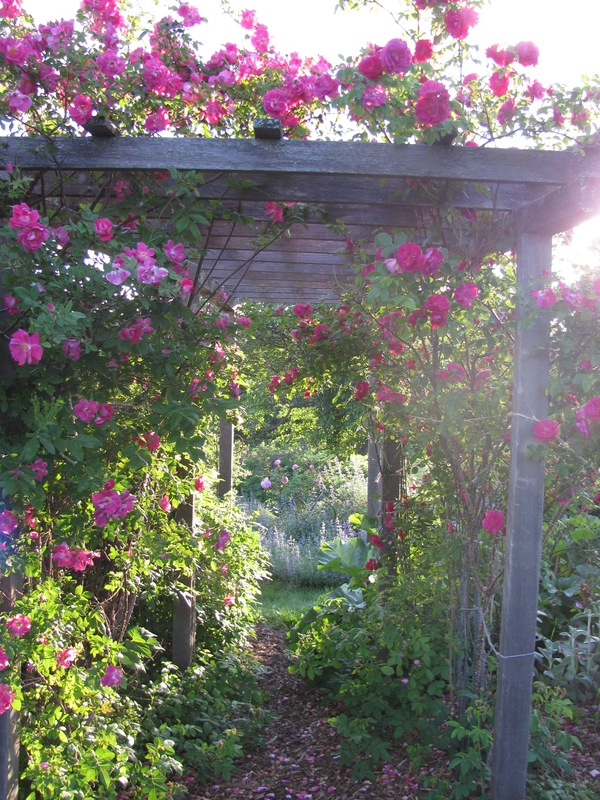 Flow Free and The Alignment Garden help us to move this energy. Additionally we can ask divinity (however we define divinity) to help with this process. Building this light shower into our daily routines is wonderful. Some people visualize this light shower in the shower as the flow of water triggers them to remember to open to receive this healing flow of light. One specific reason why this focused work is important is that when we have been using birth control, the message sent to our reproductive system is that it is not needed for the particular purpose of pregnancy. This is why communication about different goals and reanimation of the system with the pouring of light are so essential. Not only is it important to talk to your reproductive system, but it is so helpful to talk to the Angels and Elementals in your life too. Tell them what you desire and ask for their support as well as their guidance. If you want to conceive, get these beloveds working for you in a focused way. We all have Angels that are with us throughout our lives, lifting us up and helping in any way they can. There is so much Angelic help available, but the Angels must respect our free will. They can only do so much unless we ask for more. So ask for more! Out loud! Ask for what you need. It is in your hands to get the divine helpers fully focused to support you in this wonderful work. Elementals literally manifest ALL form on Earth so of course they are involved in helping us conceive and give birth. Ask for their specific help! They will appreciate you acknowledging them and their vital role in creation and will support you in profound ways. 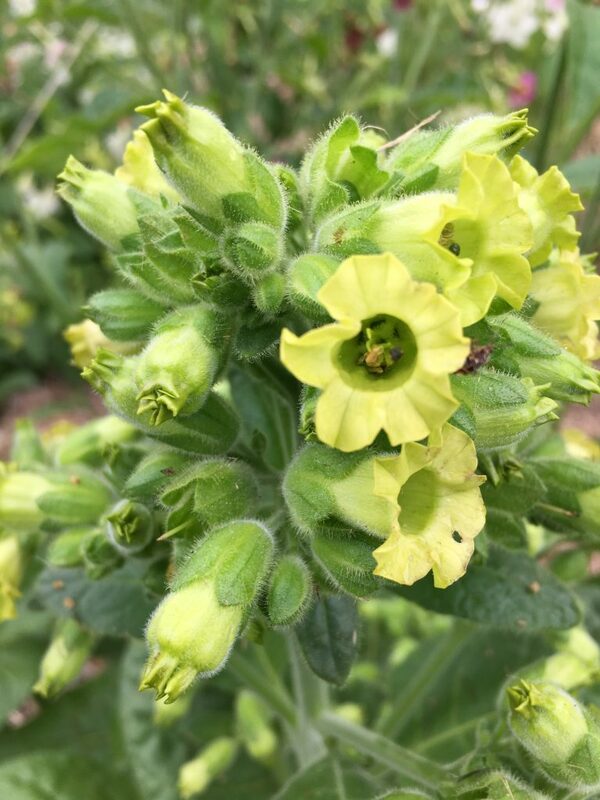 For more on the Angels and Elementals, see the article ‘Green Hope Farm Flower Essence Vocabulary 101’ on the Resources page of our website. 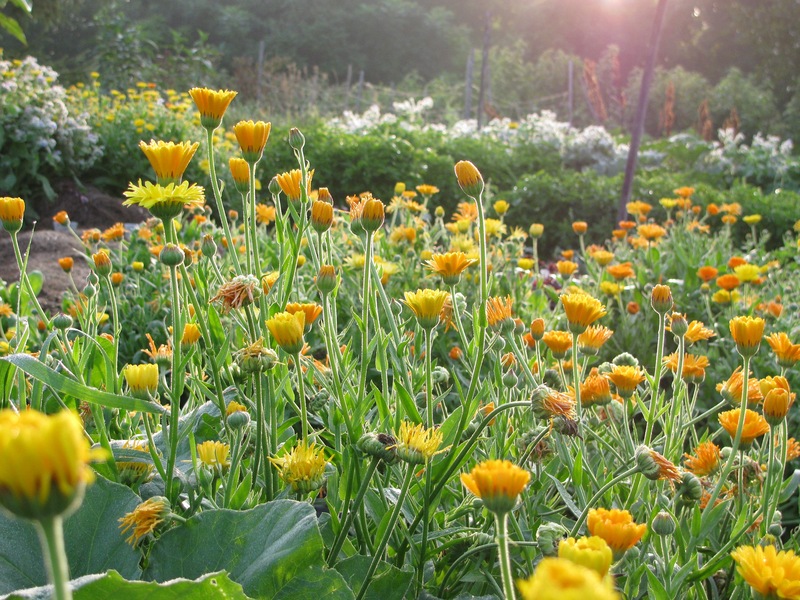 The Alignment Garden– This powerful combination Flower Essence helps us get all the systems of our physical, mental, etheric and emotional bodies working together in harmony, homeostasis and optimum wellness so there is a smooth integrated flow of energy as we welcome in a baby. Blackberry Rubus allegheniensis Blackberry offers wisdom about all rhythmic systems and processes of the body including our menstrual cycles. It also has an ability to help us untangle knots and resolve issues of long standing and great complexity. Its I AM affirmation speaks to its strengths of supporting us at the crossroads of bringing a child into the world. I AM one with the rhythm of God. I AM one with the in breath and the out breath. Clivia– Clivia miniata Clivia helps unleash the creative powers of the second chakra with an emphasis on supporting concrete results. Calabash– Crescentia cujete Calabash is a rock of strength, love and nurturing. She supports women so they do not feel they have to trade their life force energy to get what they need. She cradles and protects women as they go for their dreams. When we want to have a baby, she is a brilliant midwife for the whole project. Kikinda Squash Lagenaria siceraria Kikinda Squash is mentioned in every category because the Angels tell us it is THAT important. On the blog on October 5th 2017 you can see photos not only of the blossom of this fertility dynamo but the way its Flower reaches to the skies then when fertilized becomes a seven foot long fruit. Pomegranate– Pomegranate holds much wisdom about the release of eggs from the ovaries. 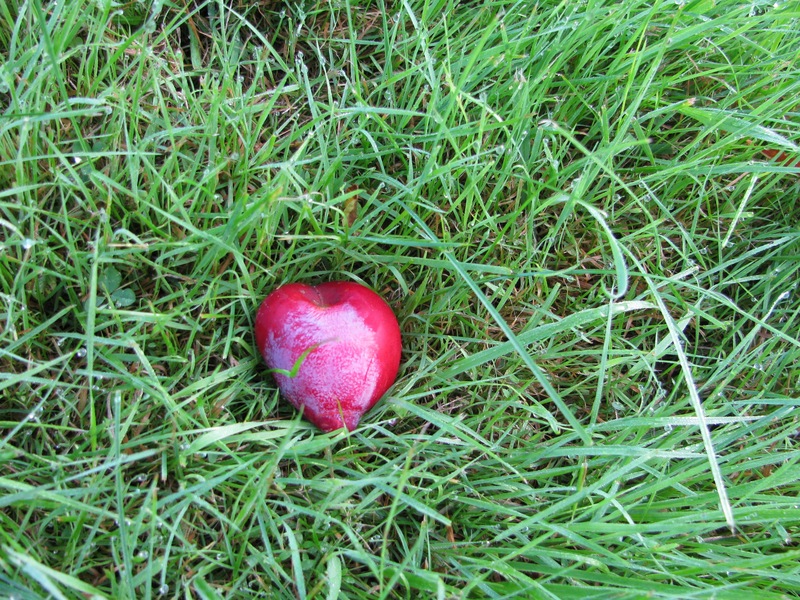 The seeds of a Pomegranate represent this link to our ovaries. It also helps revivify the entire reproductive system, so it is a particularly important Flower Essence for women. Scarlet Cordia– Scarlet Cordia is for fallopian tube health and wellbeing. It is excellent for clearing blockages and keeping the passageways of the fallopian tubes clear. Zucchini Curcubita pepo Flower Essences from the squash family help us ripen and bear fruit. In addition to this, Zucchini also helps restore us to full vitality if we are exhausted or weary. 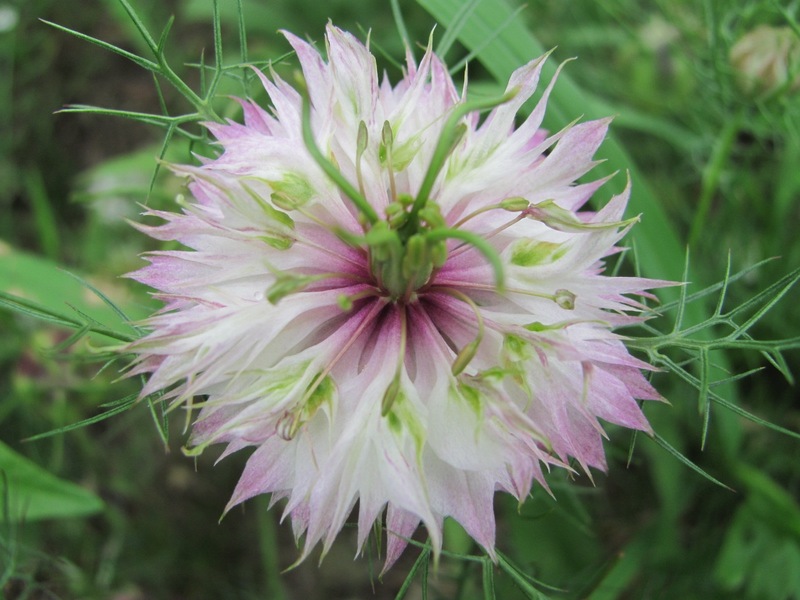 Watermelon– Watermelon has a creative energy unlike any other Flower Essence. It helps us tap deeply into our creative momentum from other lives releasing a confidence that we can create life again. The Angels suggest both partners take whatever Flower Essences you choose to work with. They add that in circumstances where only one partner is physically involved in the conception process, it is still very helpful for the other partner to work with the Flower Essences and thus help hold a high vibration space for conception. The Eight Garden– This Venus Garden combination remedy is one of the mystical powerhouses in our collection. It dissolves the interface between things out of manifestation and things in manifestation so that it is that much easier for babies to come from a non-physical state into the physicality of our bodies. Giant’s Causeway– Conception is a spark, a leap, a moment in which things are bridged, and this ancient Irish Essence is all about that moment. It brings the energies between worlds together so a baby can move into manifestation in our system with greater ease. Grounding– This combination remedy helps us be fully present in our bodies. To be fully in our bodies means to be available to all messages our bodies are sending us about when best to work on conceiving. It also means we are home in our bodies to receive the incoming soul. Kikinda Squash Lagenaria siceraria This Essence is very important for male and female fertility. Its beautiful wide open Flowers reach way up into the sky. 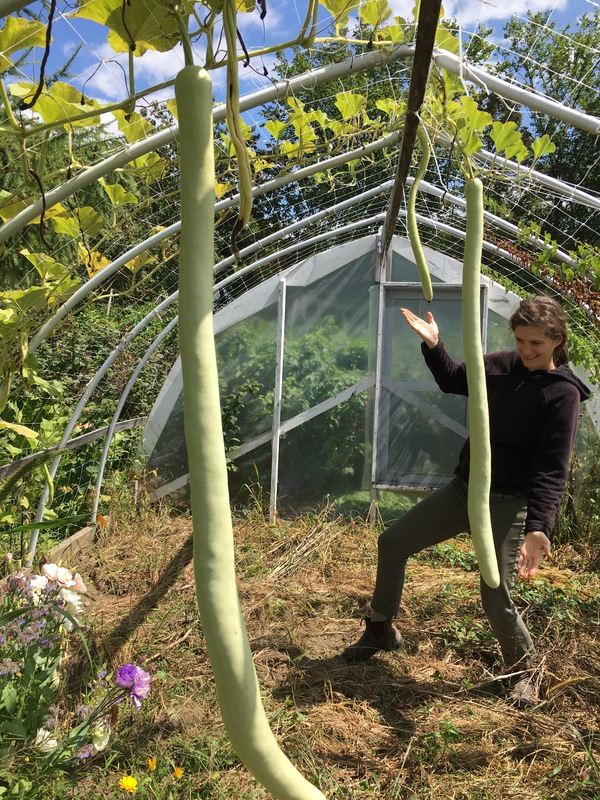 Once fertilized they grow into immense seven foot long squash unlike anything we have ever grown- It really shouts FERTILITY! Partridgeberry– Michella repens – An excellent Essence to use with your partner as this one is all about partnerships bearing fruit. When it blooms, two Flowers make one fruit. It helps to unify and align both members in a partnership to help open the way for conception without impediment and with great harmony of purpose. Precious Blood– This combination remedy contains all our Red Flower Essences and all our Flower Essences connected with blood and bloodlines. It is a very good Essence to work with before and during conception as it helps resolve difficulties carried in the bloodlines and bring forward bloodline strengths. Shrubby Cinquefoil– Pentaphylloides floribunda– Another gem for helping us to bring through the best genetic information for conception. Watermelon– Citrillus lanata var. lanatus A flood of watermelon colored light comes with this Essence, helping us open the doors of our creative selves so we approach conception with a love and joyful confidence that permeates the situation. Flower Essences bring so much support when a couple has been dealing with infertility. We can’t speak too highly of their gifts in this regard. You will notice that many of these Flower Essences describe themselves as problems solvers of situations that have defied solutions. So many of the issues of infertility are both mysterious and have defied solution, so we are glad to bring to your attention these Flower Essences that have proven helpful for so many others. Yellow Rose of Texas– Rosa ‘Harrison’s Yellow’ This Flower Essence has long helped GHF friends to solve fertility problems that have defied solutions. It is the Essence the Angels suggest most for mysterious infertility issues. In fact, they asked us to put it first on this otherwise alphabetical list. Belerephon of the Open Door– If the doorway has seemed stuck closed for a baby to enter, this one brings support to open that door. This is one of those mysterious Flower Essences in our collection that serves people in unexpected and profound ways. Blackberry– Rubus allegheniensis Useful not just as a general conditioner for the uterus but specifically to help unknot any problems in our rhythmic systems or any knot we need to untangle in order to conceive. Cyclamen– Cyclamen Cyclamen supports healing the cervix of all trauma, violation, sorrows or physical challenges. See the description above for ‘Women’s Reproductive Health’ for more info. Cacao– Theobroma cacao This very nurturing and powerful ally of a Flower Essence describes herself as the remover of obstacles. Look to her for big support AND comfort. 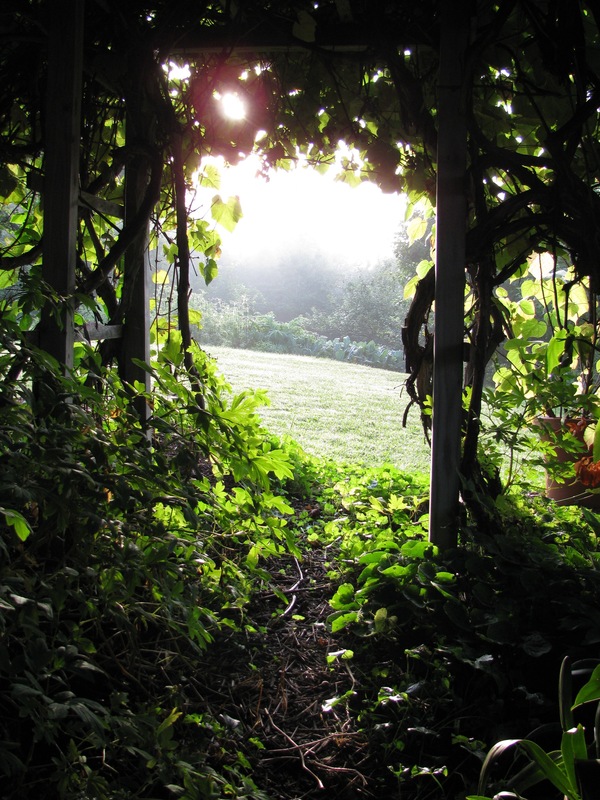 The Eight Garden– This is a profound remedy for bringing a baby into manifestation. We have seen it help in situations where challenges and loss had formerly prevailed. It is a dynamo. See the description under ‘Conception’ for more information. Flow Free– This combination remedy has proven important for all issues of flow. Not only does it help us move restorative divine light through our energy system, it helps stuck energy get moving in any system of our body and helps it keep moving. Kikinda Squash Lagenaria siceraria The Angels can’t say enough about this fertility dynamo. Check out its photograph on our website to get a sense of its powerful support. Nodding Ladies Tresses– Spiranthes cernua This orchid helps us untangle fertility issues even when they have previously resisted untangling. Scarlet Cordia– The Essence to look to if your fallopian tubes are compromised in any way as this one offers information about clearing blockages and keeping the fallopian tubes healthy and clear. The babies incarnating right now have very specific missions connected to the spiritual renewal underway on our planet. These babies have very high vibrations calibrated to the vibration of our future planet. When these souls are born, they come into a planet vibrationally denser than their own electrical systems. This means they must figure out how to hold their higher vibrations in this lower vibration matrix until the planet catches up to their vibrations (which it will do). This vibrational difference sometimes means that these babies need to come into their mother’s body for a trial run. This short time in their mothers’ bodies helps them prepare their electrical systems for handling the current planetary vibration. It gives them the information about how to stay and when to come in to stay for a full term pregnancy. Miscarriage is always a woman’s service to the soul of the baby. In these cases, miscarriages are a service to souls who plan to return and stay for a full pregnancy after a practice run or two. By knowing this information, the Angels hope to help women with their grief after a miscarriage. A woman going through a miscarriage should be free to process the experience without burdens of self judgment. Instead the Angels hope she can rest in knowing that she has helped another soul immeasurably. Cherokee Trail of Tears– This Essence was made in cooperation with the grandmothers who walked the Cherokee Trail of Tears. It brings deep comfort and sisterhood when the losses have been many. Gorse– Ulex europaeus If we have been in despair that all is lost, Gorse helps us feel imperturbable optimism and hope. Gorse knows all is never lost. Grief & Loss– This combination remedy brings great solace when we have suffered any loss. It is a combination from our Animal Wellness collection but is for people as well as animals. As a combination it braids the strengths of many Flower Essences together to bring us layers of support in our grief. 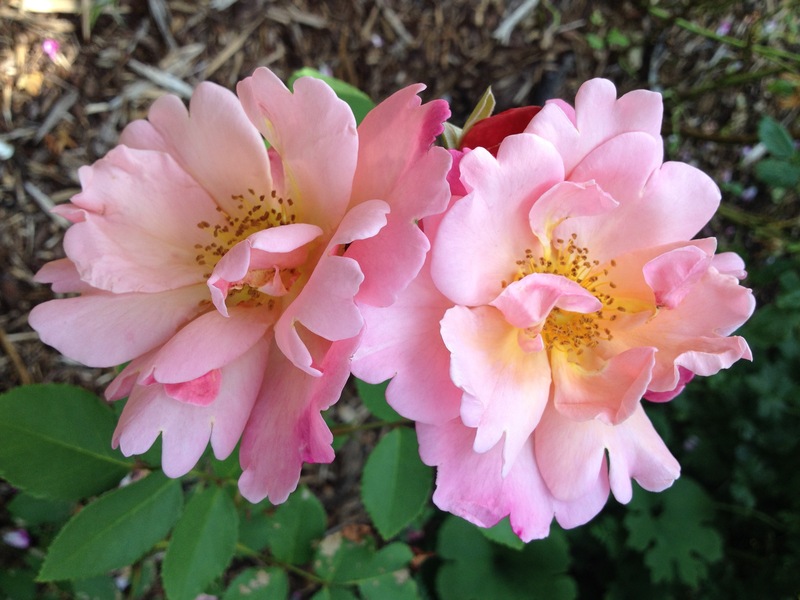 Julia Child Rose– Rosa ‘Julia Child’ This Rose helps us find our faith and have the strength to persevere. Konigin Von Danemark Rose Rosa ‘Konigin von Danemark’ This Rose helps release us from the wound of perfectionism thus easing shame spirals. It reminds us we are lovable and loved no matter what. Maltese Cross– Lychnis chalcedonica– Deep unifying comfort when any loss has felt like a tearing apart experience. 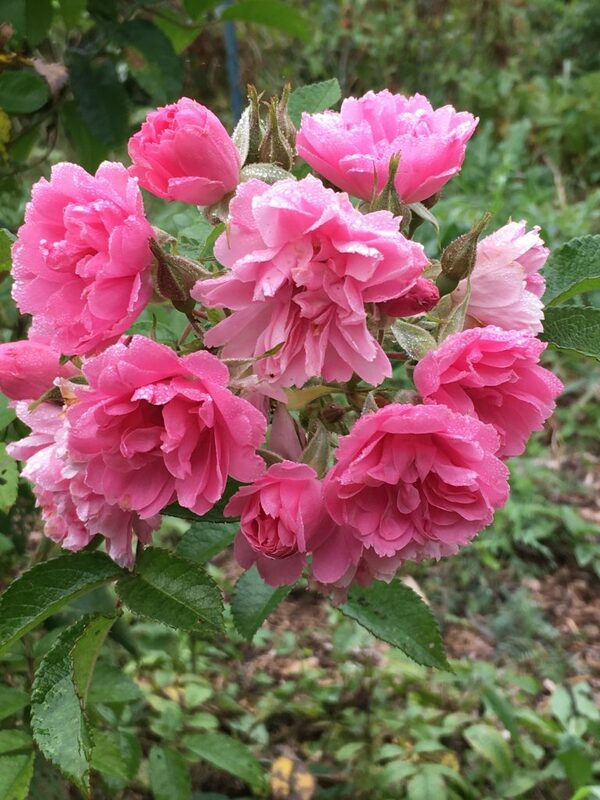 Pink Grootendorst Rose– Rosa ‘Pink Grootendorst’ A life raft of love when we feel hopeless or despairing. Pink Water Lily– Nymphaea pubescens This beloved friend helps us unburden our hearts of their deepest sorrows. The Way Forward– Momentum and support from the Camino de Santiago de Compostela to find our way forward. Wound Healing– Our combination remedy of many Flower Essences to support the healing of all wounds. This is a profound friend when we feel ripped open emotionally or physically. Many of the Flower Essences mentioned above are helpful for men, but the Angels wanted to highlight these three as particularly helpful. 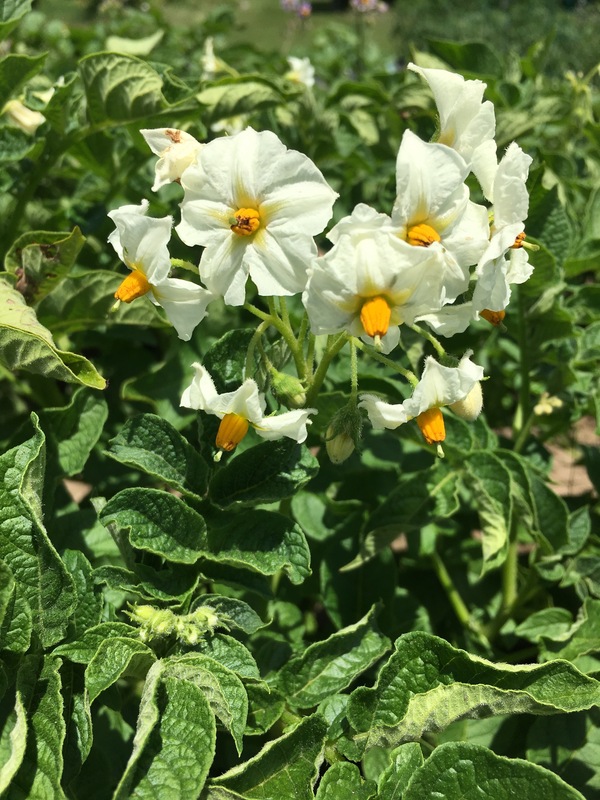 Kikinda Squash Lagenaria siceraria– Grown at the request of the Angels and Elementals who explained this Essence would offer vital support for male fertility and bring increased life force to the situation for men. 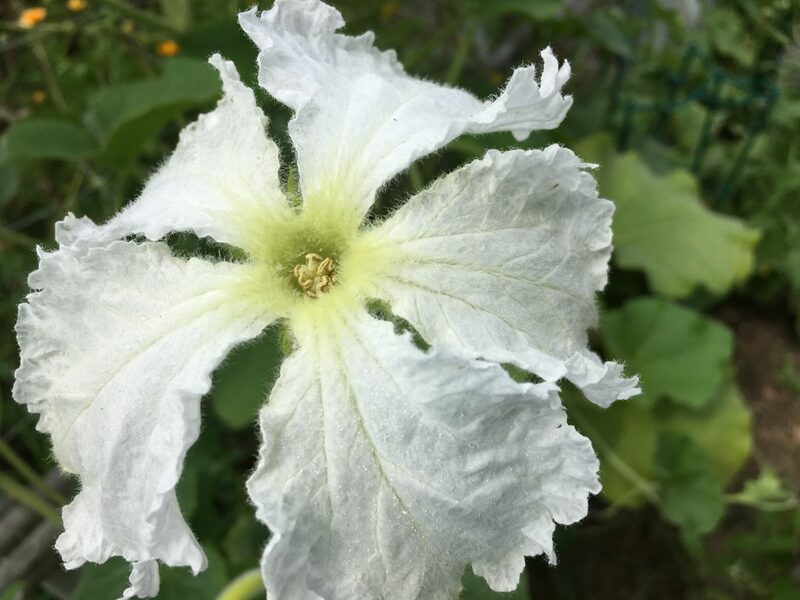 The radiant white blossom transforms into a squash that is seven feet long. 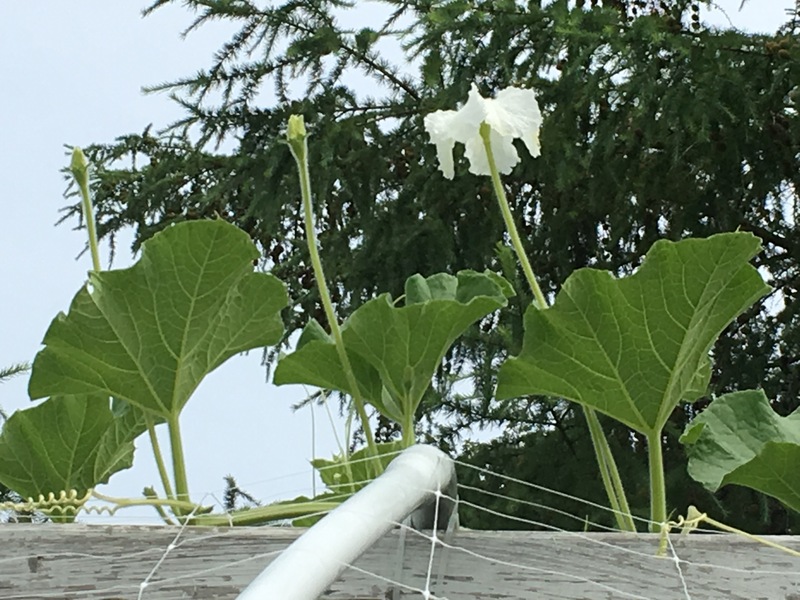 This plant really blew us away when we grew it this season as the blossoms are incredible in the way they reach for the sky and then produce these squashes that are unlike anything we have ever seen. Bells of Ireland– Molucella laevis This one has been with us for thirty years offering support for all issues of the male reproductive system. It sits at the energetic threshold of things coming into manifestation so it is particularly helpful for bringing in a child. Blackberry– Rubus allegheniensis Brings both its strengths as a problem solver and its wisdom about all rhythmic systems to support male fertility. Helpful with sperm motility. Since the Elementals are responsible for manifesting all form, Elementals are your natural allies for conception and birth. Ask for their support! They love being acknowledged for their tireless work for each of us and all Earth and will appreciate recognition and love. Flower Essences are an excellent way to work with Elementals because Flower Essences are the creation of Angels and Elementals. Avocado– Avocado has a deep link to the Elementals and brings the Elementals’ support to the process of conception. It helps parents-to-be to step into a deeper awareness of themselves as parents as well as opens the floodgates to receive. 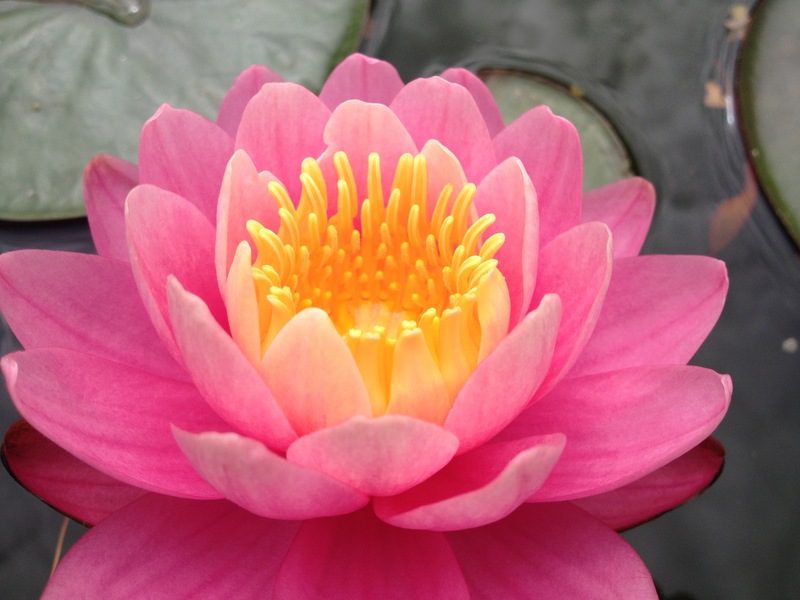 The Eight Garden– This Essence offers Elemental wisdom about bringing the formless into form. It moves us to the place at the crossroads of manifestation at the crossing of the figure eight. The Angels have hope and faith in us and the current human situation. Yes, there is immense work to be done, but yes, we can do it. To underscore their confidence in us, the Angels and Elementals have created an incredible group of Flower Essences to support us right now. These new Flower Essences are a toolbox for seeing where we are with clarity as well as hope. They help us envision the future and move towards it in constructive, healing ways. They support us to manifest our best selves on a healing planet. Just as walking in on someone in the middle of a surgery would not give us an indication of where the person is in the healing process or how things are going to turn out, the degree to which things look profoundly messy right now is not an indication that the situation is hopeless. It is a sign that we are deep into the healing, deep into the surgery. This year’s Flower Essences remind us of this hopeful truth even as they offer specific tools for the ongoing work of healing ourselves and our dear planet. 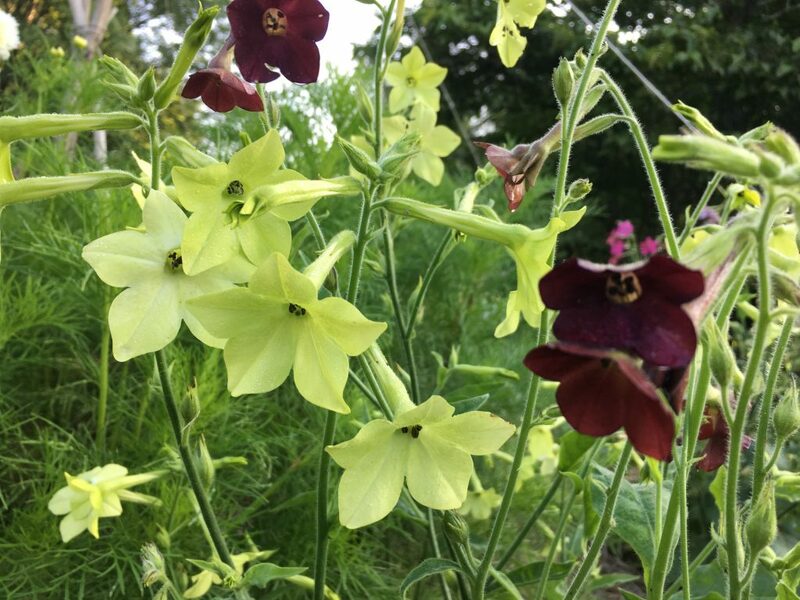 Each year a new design from the Angels for the Venus Garden grows into a radiant garden that then becomes a combination Flower Essence for you. This year’s Venus Garden Essence is called Through Angels’ Eyes. After this very tumultuous year, the vibrational gift of this Essence feels particularly helpful. Angels see us with complete clarity which means they see beneath the tarnish of our personalities to the radiant divine core of our eternal being. This means they see us and our situation with hope and confidence that love will prevail. They know that in oneness we will find our way forward. This remedy helps us see through Angels’ eyes with tenderness, hope, faith and clarity. This remedy helps us see the great purity within all of us and helps us envision a wonderful future for Earth and all her creatures. It reminds us hope is ALWAYS appropriate and never misplaced. It reminds us the divinity within us and all things will prevail. Hope is vital because without hope we close our eyes. It’s too painful to see any situation without hope. But in hopelessness with our eyes shut, we don’t see the solutions or the support we are getting to manifest these solutions. We need to cultivate hope and then open our eyes to see. This is the wisdom of Through Angels’ Eyes. It helps us see from a matrix of hope and confidence there are solutions and we will find them. Hope gives us the freedom to know we can acknowledge where we are from a framework of knowing there is a way forward. In availing ourselves to see Through Angels’ Eyes, we see the problems in their particulars, but we also see the particulars of love and support we receive each and every day from the divinity that permeates all reality. We all know someone who loves humanity but doesn’t like people. Divinity is not this kind of hands off force. Divinity did not and never has washed its hands of us. Divinity is with us in the particulars each and every moment of each and every day. Divinity is in the coincidences, the tender moments of uplift and support, the calm we find when we stop and go within, the still small voice in our hearts, the humor of life, the synchronicities. Feeling hope and noticing these things can be hard won. The culture reinforces hopelessness, but the culture is misinformed. Hope is not misguided. We will find our way forward together. It is done. This breathtakingly beautiful Flower offers a Flower Essence that is all about helping us to hold the immaculate concept for ourselves, for others and for Earth. This involves seeing the purity and wholeness of each person, seeing them without blemish or fault. 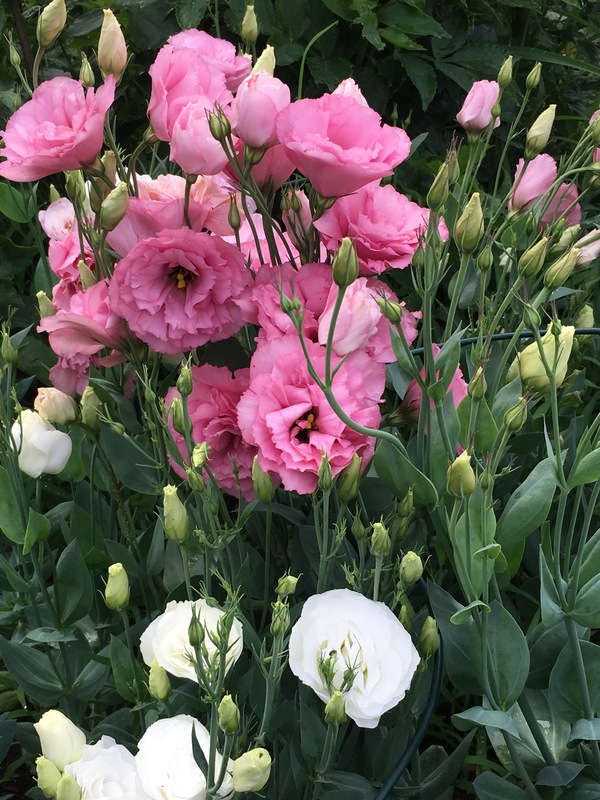 Lisianthus encourages us to tap into each person’s eternal identity unhinged from experiences in this realm of learning lessons. It encourages us to hold fast to this divine identity instead of zeroing in on the thin slice of imperfection we see play out as each of us goes through our necessary Earth experiences. To hold the immaculate concept for self and others is a profound gift. It creates a literal field of energy around ourselves and others that knows we can be victorious in fulfilling the divine plan for each of us. By visualizing the divine blueprint of a person, situation or idea it becomes that much easier for this ideal to manifest. When we hold this energy focus for another, we help them to tap into these uplifting feelings and express this divine reality. I AM one with the Immaculate concept for me, for those I share my life with and for all creation. This year the Red Shiso was planted in a mandala shaped like an eye. Vision Flower Essence was created from this powerful mandala. Years ago we grew a similar Red Shiso mandala and made a small amount of Vision Essence from the garden. It proved helpful for every kind of vision concern. We are so glad to have it available again! Consider Vision Essence when you need a view of the bigger picture. Vision also helps us see situations from different perspectives. It supports our vision about creative projects including films, theatre, dance, visual arts, music and written works. It is a transformative Essence for those with eyesight concerns. 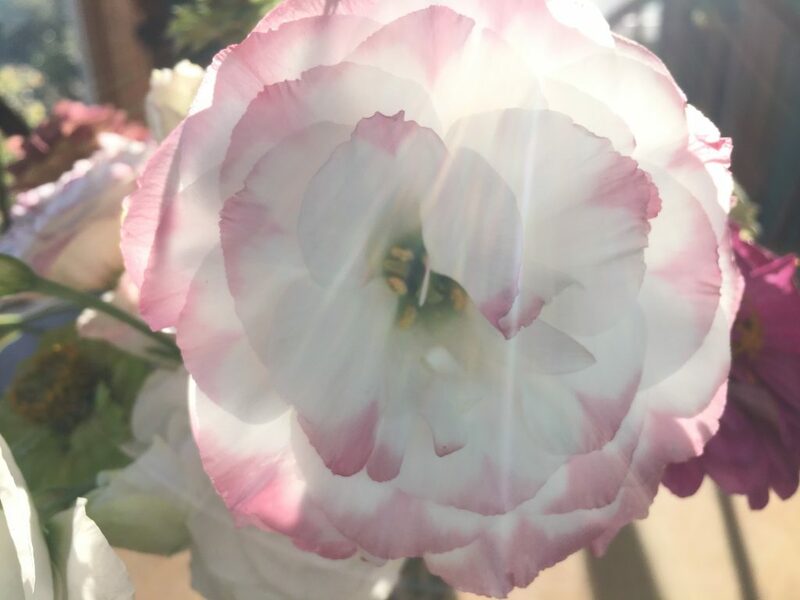 The Angels brought back Vision Flower Essence to help with all these concerns and also to help us envision the future in all its particulars and to envision the healing path we can take to move towards this future. We welcome Vision back to our line-up with open arms and from a place of knowing what an incredible source of healing wisdom it is. This Flower Essence is all about hidden treasures out of sight. It helps us trust that our efforts to heal will bear results even when those results remain hidden away. It is especially good when a healing process is protracted and progress seems slow. In this way it is a very uplifting and encouraging Flower Essence. 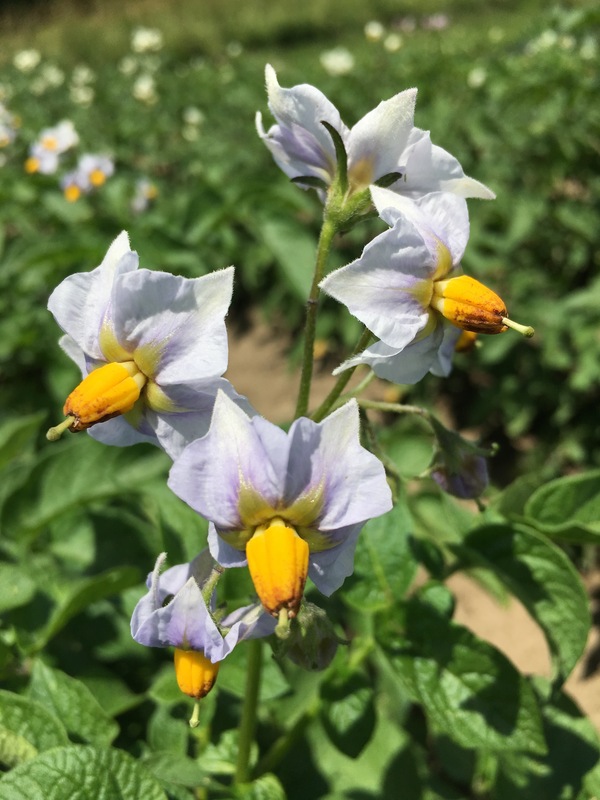 Potato Flower Essence helps us know that what we see on the surface is not the full story of a person or circumstance. It is not meant to make us more cynical but to make us aware that positive changes often happen out of view and can only be seen after the harvest. This vibrational wisdom is echoed in how potatoes grow underground with the crop only revealed when we dig them up at harvest time. I AM released from despair and doubt by a deeper awareness of life. 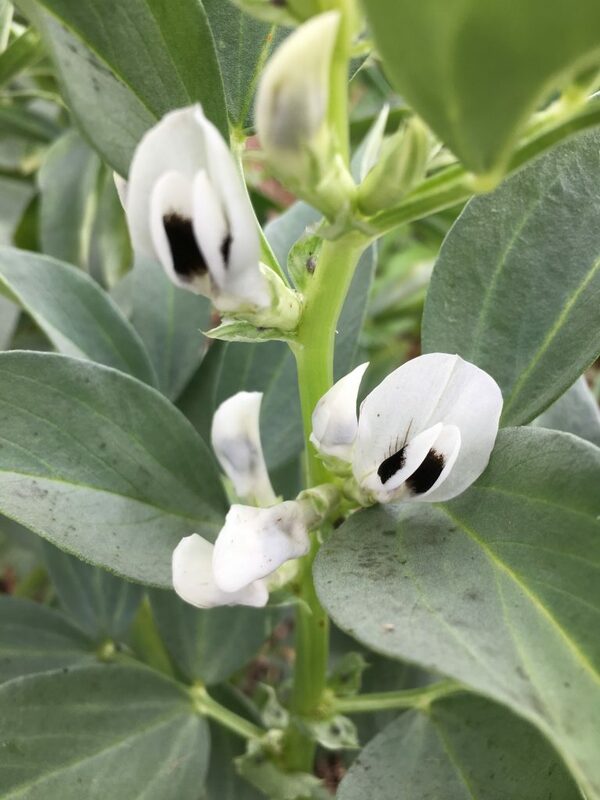 Fava Bean has unusual black and white blossoms. Its Flower Essence does not encourage us to make black and white judgments or try to sanitize our feelings into black and white extremes. We need to see and experience the greys in the world. Instead, Fava Bean helps us see circumstances with greater clarity. If you have a difficult time seeing situations clearly or if a particular situation remains out of focus for you, Fava Bean is an excellent choice as it sharpens our ability to see what is really going on. No matter the situation, I AM able to see the truth. This is a beautiful Rose of a deep saturated gold. I love that it was named after Julia Child. She was a person of great enthusiasm, but she was also a person of great persistence. This is the gift of this Rose. It helps us be both enthusiastic in our efforts and also fully committed to keep on keeping on. This persistence is so important right now when sometimes the obstacles can seem insurmountable. When working with this Flower Essence, it would be wonderful to call in the Angel of Faith to support you and fill you with an imperishable sense of faith. This deeply comforting Flower Essence throws us a life raft of love when we have been swamped by painful and difficult events. 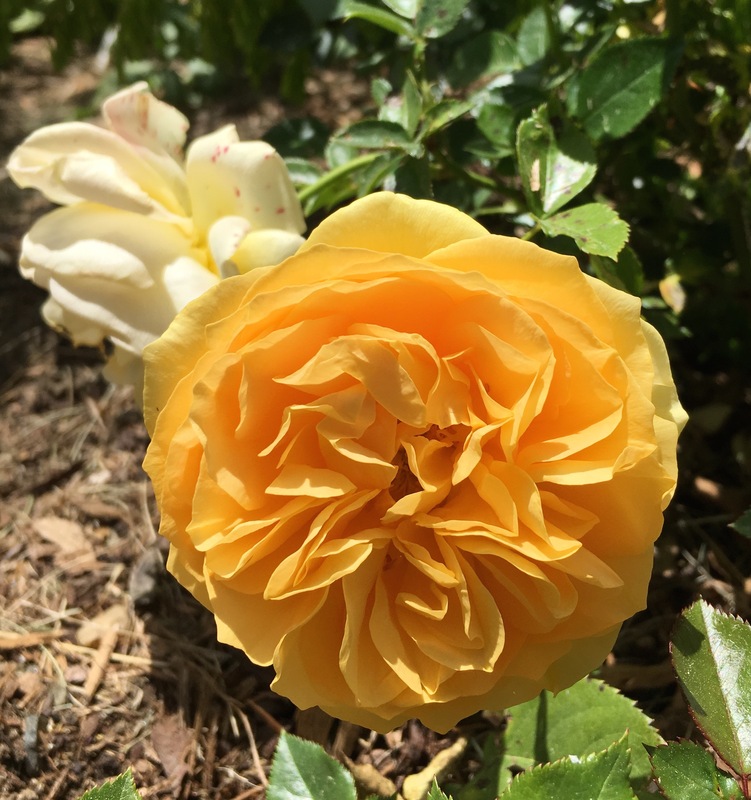 If bleak pessimism or hopelessness has seeped into our lives, this Rose vibrationally lifts us up to restore our sense of wonder, innocence and confidence that all will be well and that only love is real. I AM a life raft of love. Flowers are masters of controlled mutation and change. And that is what it is all about for our electrical systems right now as the vibration of the planet rises dramatically, and we must keep pace. 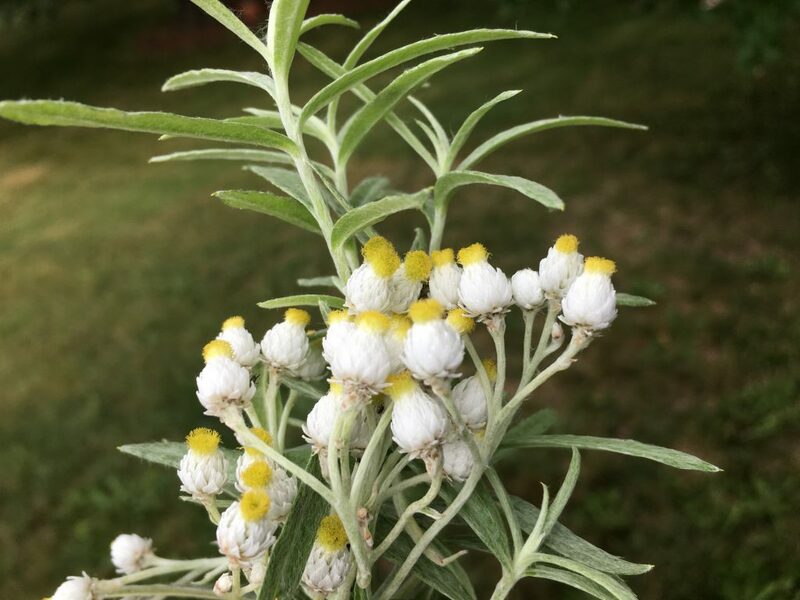 Pearly Everlasting offers support for the older generations here on Earth to adapt and stay current with rising vibration of the planet. Young people have come into incarnation with electrical circuitry adapted to the vibrational rate of the planet. Whereas those of us who have been here awhile must raise up the vibration of our electrical systems to keep pace with the planet. The older we are the more we must shift our electrical system to match the vibration of the planet. Fortunately Flower Essences are ALL about helping us make these electrical shifts. Pearly Everlasting in particular helps us access tools within us to electrically adapt and thrive. Linden is another Flower Essence to remember to use for this work. I AM the manifest wisdom of my evolving light body. 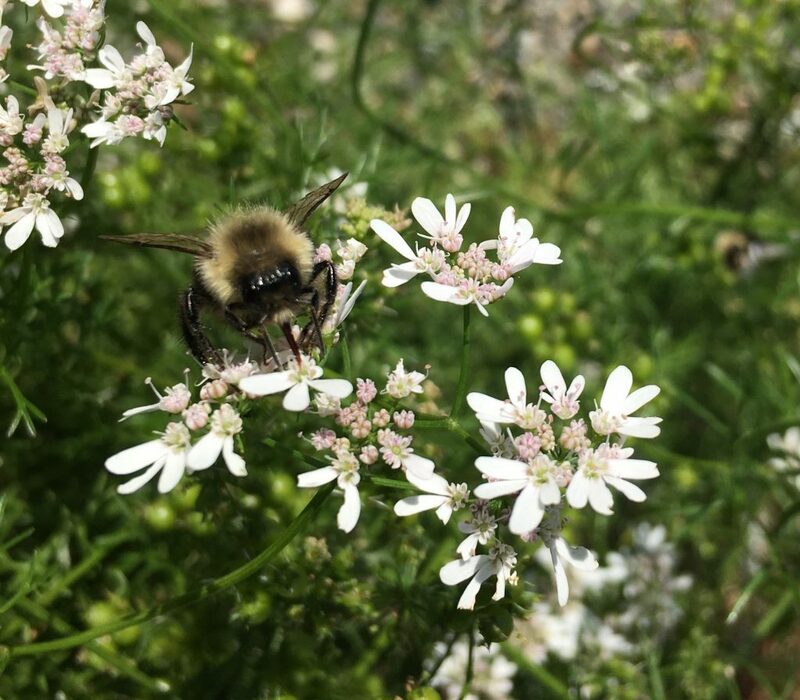 Just as the leafy greens of Cilantro help us to cleanse the brain of toxins, so too Cilantro Flower Essence offers information to support us in this cleansing work. It will stand alone in helping us cleanse and will also work in harmony with Cilantro greens to cleanse our systems of heavy metals and other toxins specifically in the brain where many heavy metals are stored. Cilantro Flower Essence also supports a deep cleansing of the mental body where we typically store outgrown mind ideas and old illusions that need to go. This wisdom about cleansing both physically and energetically opens space in our energy system and in our brains. Cilantro has a vibration of great positivity that can fill this space with an expansive sense of self as an evolving spiritual being in an evolving and healing world. Cilantro goes deep in its cleansing then matches this with its gift of illuminating hope-filled Light. I AM a force of positivity and change. I AM clarity of thought. This extraordinary Flower Essence is for male and female fertility. Its radiant blossoms reach for the skies then grow into seven foot long squashes. The Angels explain that Kikinda Squash is going to be a profound support for male fertility which is in a drastic decline in first world countries with sperm counts down by fifty percent. I AM the movement between the stars and the earth. I AM manifestation. 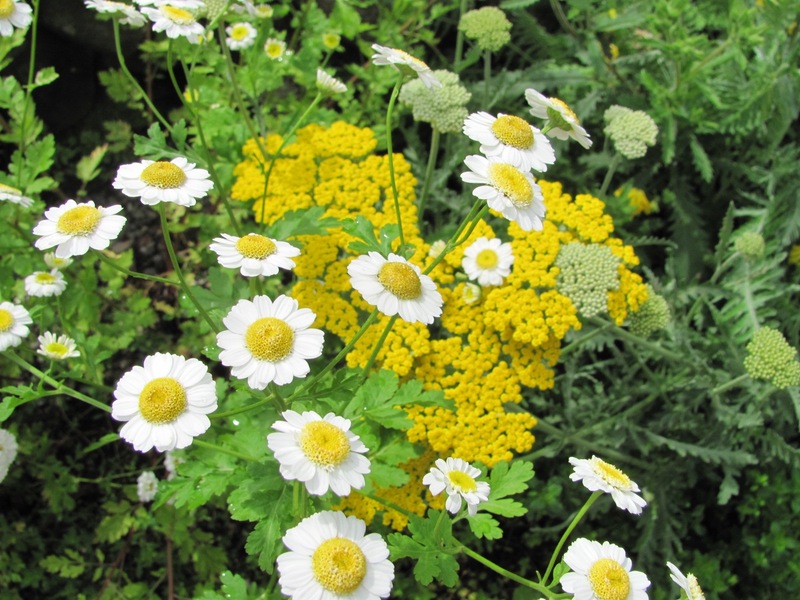 To support issues of fertility and conception we have searched the Earth for helpful Flower Essences. Please ask us to email you our comprehensive document on Fertility, Conception and Green Hope Farm Flower Essences or include a copy in your order. You can also find this information on the resource page of our website.